Since its initial reveal way back in 2015, not a whole lot has been said about Nintendo and Universal's joint Super Nintendo World project. At the end of 2017, we learnt that the Orlando park would be bigger than originally expected, but things have been rather quiet as we build up to the main, Japanese park's 2020 opening. 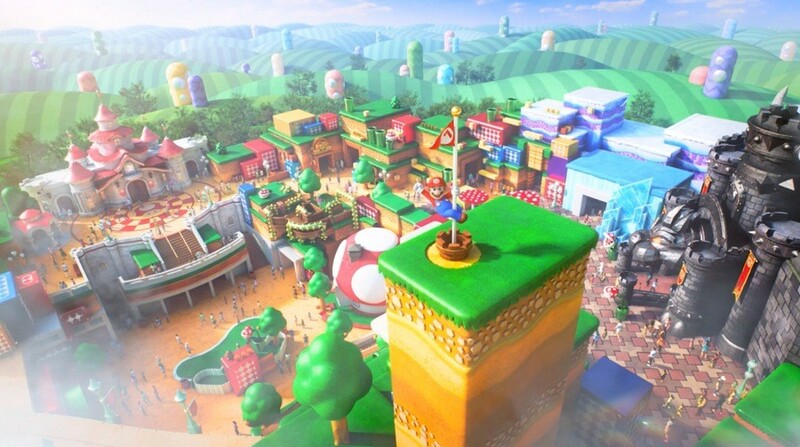 Shedding a little more light on its progress, Nintendo's very own Shigeru Miyamoto has provided a statement telling us exactly where the theme park's development is currently at, as well as confirming that a launch for the Tokyo Olympics in 2020 is still the main aim. Teasingly, he says that both the Japanese park, and the ones planned for the US, "will be really worth the wait". "Because the theme park is operated by Universal Parks & Resorts, we cannot talk about anything they have not yet announced. But ever effort is being made to advance preparations, and Unviersal Studios Japan is our top priorities, as is making sure we will be ready by the start of the Tokyo Olympics in 2020. After the opening in Japan, "SUPER NINTENDO WORLD" areas will also be built in the parks in Hollywood and Orlando in the US for the enjoyment of everyone." Of course, "everyone" doesn't include us poor souls in Europe, though, does it? Boo, hiss, etc. "We are in frequent contact with Universal Parks & Resorts, working closely together to develop the theme park fro a creative standpoint. Building work on our area at Universal Studios Japan is progressing, and the construction of interiors will be starting on a full-scale operation. Osaka is close to Kyoto, so we check on the progress of the work frequently. I think it will be really worth the wait." Just to tease you a little more, we'll leave you with the official trailer for Super Nintendo World which was shared just over a year ago now. Can we just go there, already? Who's up for a Nintendo Life community field trip next year? I normally don't care THAT much for theme parks but I would love to see this park in action with all the Nintendo stuff in it. Just wonder if Japan will have the best stuff. It’ll be cool to see a roller coaster ride with a Mushroom and Golden Mushroom to indicate the roller coaster is gonna go crazy fast. A Luigi’s Haunted Mansion would also be really cool. Just as long as the have someone dressed as Wario walking around eating garlic and farting loudly it should be a good time. I really, really need to go here at some point. Maybe in tandem with my next Disney World trip. I am delighted Super Nintendo Land is being built. It will be gorgeous based on the renderings and Universal's stellar work on its Harry Potter areas. That said... I'm less optimistic about the rides. Universal has a reputation for A-film based rides where the seat shakes in front of a large movie screen & B-nominally themed rollercoasters. I absolutely don't want Nintendo to get sucked into the Disney vortex (which is why I was happy about the deal with Universal), but Disney does better rides. I do expect them to be rather cool--otherwise what a total waste. @Muddy_4_Ever With any luck, it'll have a lot of even better, more inventive attractions than rides. I just hope that this goes off really well for them and cements Nintendo's rightful place in mainstream consciousness. Lord knows SOMETHING needs to counteract the sheer edge of the last two decades. Wasn’t there a bunch of rumors that it was on hold in Orlando? This is why I need to learn japanese. I wanna go and see this for sure! I'm up for a Nintendo Life Community field trip next year! Probably cheapest to make this not during the Olympics though? Correct me if I'm wrong pls! That’s either going to be heaven or hell for Charles Martinet. Being the consummate professional I expect he will love it. I know these are a few years out for NA, but I need to plan a trip to either of the two Universals (probably Orlando) anyway. I still really want to check out the Harry Potter section. @LUIGITORNADO there were recent rumors kd was going to be scaled back a good bit in Orlando. So it wouldn’t be an expansive and wouldn’t include as many attractions as originally planned but those were just rumors. It came after Universal said F&F ride failed to generate any major uptick in visitors. @Muddy_4_Ever Based on Disney's money-making machine, I wonder if Nintendo is looking at themed cruises and resorts? This really could give Disney a run for its money. All the better, because that will entice Disney to build even better stuff (and so on). This is the same quote from last week, but this time properly translated by Nintendo themselves. And of course there is no mention of a London location, which never made sense as there is no Universal London. "But ever effort", "Unviersal Studios" and "fro a creative standpoint"
Well @ryancraddock, it also doesn't include us Canadians. And with America being really strict on their borders & pretty crappy to Canadians in general ever since you know who came to office, it's just as difficult for us as Europeans to visit. Would be nice if Nintendo stopped treating North America as one open region, and stopped doing that for the West in general. This will end up being one of my life goals when it is officially built! Read up on the new Harry Potter Coaster coming to Islands of Adventure this year. That should ease your concerns that US just does simulations. The area has not been scaled back. Instead of putting the Nintendo area in what is now the Universal Studios Kidzone it has been moved to the upcoming 4th(or 3rd depending on your thoughts on Volcano Bay) park, theorised to be named Fantastic Worlds. It will be one of the main anchors of the park. Universal just debuted a meet and greet with a Trolls character that farts glitter. So anything is possible. The first time I went to an amusement park, as in, an A-lister of an amusement park, was when I was, like, 28, an year ago. And even then, it's an A-lister only by Italian standards. I have my doubts about ever being able to go abroad even for a vacation (without counting Switzerland, as I live close to its Italian borders), whether in the UK or the US, let alone Japan. Bottom-line: I don't think I'll live long enough to be able to pull it off. But hey, never say never! This must all be so confusing to the non-gamer. A theme park in which the mascot is an American-Italian plumber from Brooklyn, running around grassy blocks with coins, jumping up a flag pole to observe a pink castle and pipes everywhere. @EvilLucario We live in Michigan, but go to Universal Studios Orlando all the time. My son and I are planning a trip to Universal Studios Tokyo for shortly after Super Nintendo World opens. Two of my favorite things in one place, it's pretty exciting! I already have a Japan trip in place for 2021 to go. Soooooo excited! Want to go soo bad. @Lionyone Yeah, I agree. I'm down for a field trip too! (but not during the olympics). They should build Super Mario Odyssey into a theme park, and installed some trampoline so people can bounce their way around. I’m saving for Tokyo 2020!! @AlexSora89 Hugs. Never say never. Build your own business. Make it. @JonSpangler the Harry Potter section of Universal is literally the only decent part of the park. I’d consider that an exception, not the standard. Maybe the park will have a Metroid ride! @JonSpangler also I was agreeing with someone who said they’re all simulations AND coasters, adding that the majority are simulations. I even said they might have a Nintendo coaster. The ones that aren’t simulations are coasters. Not much more creative. On the other hand, look at Disney. They have only a few rollercoasters and even less simulations. Each ride is tailored to the movie/franchise. Say what you want about Disney, but their imagineers know how to be creative. Universal just does simulations, mixing it up with a coaster occasionally. Their one area that is done pretty well is Harry Potter and it still could be better, and I say that as a huge Potterhead. I'm kind of trying to write a novel for that exact reason. Gotten to Chapter 20 so far, 60-something pages on Word. Meaning that in pocket book size, I'm roughly around 100-something pages already. Disney does indeed provide better experiences with rides. They have designed some turds but mostly they succeed. I have a source telling me that the rides are the exact reason the construction is taking so long. Nintendo, understandably wants a more immersive and video game like ride experience and is constantly asking for changes which Universal is having trouble getting done. Hopefully! I'm roughly beyond half the story I want to tell in the book; in all of my efforts to write one, this is easily the most successful so far. What's more, I'm deliberately placing some "bad writing" signs such as lack of details on some characters and plot holes somewhere else. It's all part of one gigantic twist I'm saving for later, though, so the novel will have to prove its worth in spite of its faults. I would say the HP sections are not the exception but the new standard. While in the past Universal might have been been a tier lower lower then Disney every time they redo or update they have met that Disney Bar lately Simpsons section, Harry Potter, Kong (sure it is a screen ride but the theming and line are amazing). Volcano Bay is also an amazing fun park. The new hotels are way better then Disney dollar to dollar. And Halloween Horror Nights raises the bar every year. As for Universal being just coasters and simulators. All of Dr. Seuss Island, JP River Adventure. Dudley Do Right and Bluto Raft Barge, Doctor Doom Freefall, ET, MIB ride. Mummy may be a coaster but is filled with theming and animtronics. Spider-Man may be a screen ride but there is a reason it has been voted a top ride year after year. And the new HP coaster will be another that adds so much more then just being a coaster. I could write more but Lego Movie 2 starts in 2 minutes. I really wasn't impressed with Universal Studios California. It all seemed really stale and past its prime. But next time we go to Japan, I'll definitely visit Nintendo World. I'm guessing the deal with Universal Studios is that Nintendo can't go around and make Nintendo Lands with other partners. Besides, opening a new park must be quite costly, and although as you say they would probably have enough money to do so, it also needs to be profitable. I don't know the details, but apparently Europe had some kind of a Universal Park before in Spain, but probably due to not making enough money, not anymore. Europe could be a bit difficult target with less people than in Asia, and not a common language like in the United States. Of course it's not impossible, but it is also very likely not as easy as you make it sound. These things must require an immense amount of money and the proper deals, and also be able to get that money back rather than just lose it, to make business sense. But whoever opens one in Spain is kinda... let's say financially ridiculous... It would make sense to open one in Germany around the borders to the other Western countries like Benelux or Fance and Swiss or in France around the same borders, where millions of people are living and financially strong enough to go to a theme park. True we got less people but there are places with high density like the German Ruhrgebiet, there are over 10 million people living there. Or Paris has over 10 million people too.